You’ve decided to start a new solo business, but you don’t know where to start with marketing or you’re not seeing the sales growth you hoped for and expected. You’re not alone. This is a common issue among solopreneurs. Many solopreneurs start a business because they have a passion for it, but lack experience in marketing. Perhaps you’re a fitness enthusiast and you’ve become certified in personal training, but you haven’t picked up more than a handful of clients. Having a passion and assuming the customers will come to you is not enough. In order to be successful, you must focus on selling your services or products through marketing. 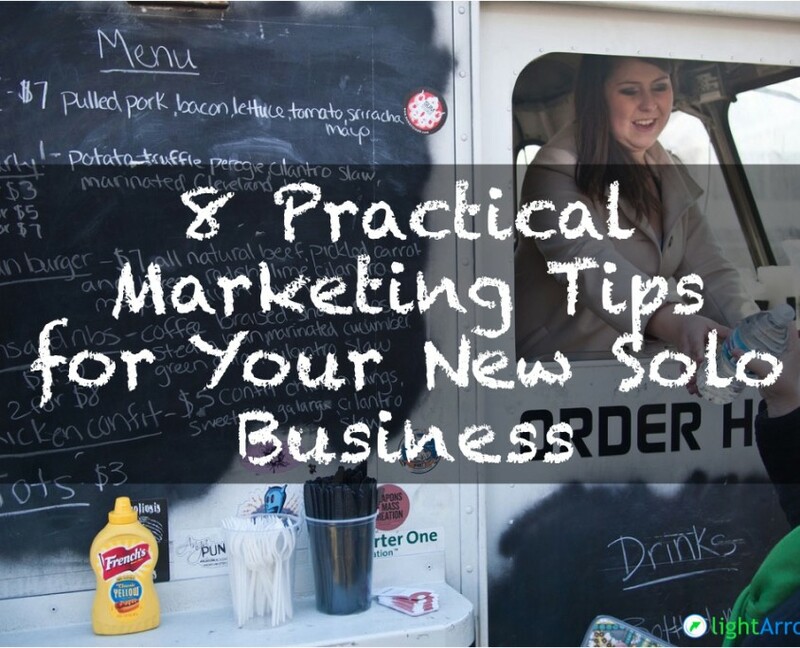 If you really want to rock it as a solopreneur, keep reading to understand the latest practical and lean methods for marketing your solo business. Every business is different. For example, marketing yourself as a Food Truck Vendor is quite different from marketing yourself as a Plumbing Contractor or REALTOR®. When searching for a Real Estate Professional or Plumbing Contractor, potential customers might search the directory at the National Association of REALTORS, Angie’s List, or Home Advisor. While a Food Truck Vendor will most likely be found on a site such as Yelp, which is the strongest in restaurant listings. Prepare a persona of your common customer. Understand their demographics, such as age, income, gender, education, ethnicity, household composition and employment status. When you better understand your customers, it will give you clues as to where you will find potential customers. For example, perhaps you own a food truck that sells non-GMO, organic, gourmet hot dogs in Austin, Texas and you set up your business in a trendy part of town. You might find that you will be marketing to Millennials. If this is the case, find out where the Millennials go online. It’s of upmost importance to emphasize your key differentiation that pertains to that target audience. In this case, your key differentiator might be that you offer organic, non-GMO foods to a generation that is more concerned with the quality of the food they consume. After you understand where your prospects flock, you can build your online presence through your owned web properties. These days, it’s essential to have a website or at a minimum – an online storefront. Many solopreneurs are worried that they lack the knowledge to build a professional website on their own. However, hiring a professional is not always necessary, depending on your needs. If you don’t know where to start, locate an online course at Lynda.com. It’s an excellent source for getting you started with building a website. You will be surprised to know that building professional websites without a programming, graphic design or a web design background is easier than you thought possible. Before you get started, review general information architecture guidelines, domains, SEO guidelines (discussed later) and basic HTML. Review tools such as WordPress, GoDaddy Website Builder, Weebly, Wix or webs. Internet search is the most used tool for locating businesses these days, which makes local listings extremely valuable. In fact, according to BIA/Kelsey and ConStat, nearly all consumers use online media when searching for local products. Moreover, many of the online directories include customer reviews, which makes quality and high-ranking reviews more important than ever. Consider that according to Search Engine Land, 72% of customers trust online reviews as much as personal recommendations. If you do business locally, ensure that you list your business at popular directories. HubSpot provides a great list of 50 online local business directories. In fact, getting listed improves the visibility of your company online in many ways. If you have quality data in your online listings, when people search for you, your rankings will be higher in the SERPs (Search Engine Results Pages) for local results, which creates more business for you. A few factors (there are many not listed here) that affect your rankings include: profile completeness, accurate and up-to-date information, plenty of reviews/positive reviews, getting reviews consistently and high authority reviews. Because of these factors, it’s imperative that you monitor your online reputation to ensure your customers are happy. Respond to poor reviews when possible, and attempt to make it up to unhappy customers by offering free products or services. Through your reviews, gain knowledge of areas to improve in your business and gain insights into your key differentiators. Understand what you’re doing really well so you can promote it. For example, if customers love your location, convenience, friendliness, service or price, key in on emphasizing these differentiators. For a small business, it’s imperative that you encourage customers to do positive reviews because word of mouth shapes new business. Prompting reviews is an excellent tactic. For example, I recently purchased an item from Amazon.com. After it arrived, I received a personal message from the business owner asking how I liked the product. I responded with a positive review. He asked me if I could possibly copy the review to Amazon for the product. I was happy to do so because he went above and beyond to ensure that I was satisfied with their product. As a solopreneur, your time is limited. Building a social presence is time consuming and it takes a lot of perseverance and patience. Focus on the social networks that give you the most bang for your buck. Once again, using the example of the gourmet hot dog vendor with the millennial customers, he or she should focus her efforts on Facebook, Instagram and Snapchat. Whereas, LinkedIn, Pinterest, Google+ and Twitter are lower priorities because studies show these social networks are not as relevant to that targeted demographic. Set up profiles on each of these social networks and put a fair amount of effort in posting, engaging with and following others. Make publishing less stressful and more consistent by using tools such as Hootsuite or Buffer to schedule social media posts. Use the 80/20 rule when posting. Curate 80% of your content and the other 20% can (and should) be promotional. Prepare eye-catching, beautiful headers that seize and correctly represent your brand, in a succinct way. Are you worried that you don’t have the design experience you need? You can create beautiful designs using tools such as Canva or Pablo with little or no design experience. If your budget is slim, Keynote and PowerPoint are also useful tools for easily building graphics for your business. After you’ve spent some time building an audience organically, take advantage of the advertising that is available through the networks that you choose. Advertising on a social network such as Facebook is typically not effective if you haven’t built some clout so don’t jump in with paid advertising on day one. As a solopreneur, it’s good to understand Search Engine Optimization (SEO) and how keyword research is a critical aspect of it. Essentially, good SEO practices ensure that your business appears online frequently and to the correct audiences when consumers search for a product or service you offer. Unfortunately, SEO is very confusing and the algorithms are constantly changing. There are a number of factors that affect your rankings that cannot be explained in this post; therefore, I’m only covering keyword research. As you begin your journey as a solopreneur, perform thorough keyword research to identify the phrases that are commonly used on search engines when people are searching for information, services or businesses like yours. Discover and identify the top 10 – 20 phrases you wish to rank well for. For example, the gourmet hot dog vendor discussed earlier would most likely want to rank highly for phrases such as “best organic hot dogs in Austin” or “best food truck in Austin.” To understand if these are phrases that are commonly searched, this vendor could use the Google Keyword Planner or other keyword research tools. After you’ve established the ideal keywords for your business, ensure these words are consistently used across your owned web properties, advertisements and social media. Make a list and keep it visible whenever you’re building and sharing content. Unfortunately, SEO takes a long time to build and the top keywords are incredibly competitive. Competing with large companies who spend thousands of dollars monthly on SEO efforts is difficult for solopreneurs. Fortunately, solopreneurs, entrepreneurs and small businesses can follow a “pay to play” approach to get noticed. SEM (Search Engine Marketing) is another method to ensure that your solo business appears to the correct audiences when consumers search for a product or service you offer. Typically, a search engine such as Google, offers sponsored links on the SERPs with a different placement than the organic results. Google Adwords is the most popular Pay-Per-Click advertising program. Using Adwords, solopreneurs can set a budget and only pay when consumers click or tap their ads. Essentially, the ads are based on keywords, which makes the keyword planning exercise I mentioned earlier come into play. Typically, you will drive these consumers to a web landing page that is optimized with the keywords that you selected, but you can also direct them to your website or to an article, depending on your goals. Keep in mind, that your competitors are also bidding on the same keywords; therefore, your bids should be competitive. What’s great about Google Adwords for small local businesses is solopreneurs can target their ads in regions, cities or by a designated distance from their business. There is a learning curve for setting up Google Adwords campaigns. I recommend, once again, utilizing a course from Lynda.com to get started with Google Adwords. Digital Marketers and Public Relations professionals have been using content marketing for years to build their company’s brand, grow awareness, to drive traffic to their websites and for customer engagement. This approach is also valuable for solopreneurs, entrepreneurs and small business owners. Creating and sharing quality content builds trust in you, establishes you as an expert in your field, and helps you engage with your customers. For example, imagine you practice Chinese medicine and acupuncture, but you haven’t built the clientele that you wish to have. Creating a website with a blog with articles explaining conditions that acupuncture and Chinese medicine can help will establish you as an expert. Consequently, more consumers will know about you; and it will encourage trust in you. Content for small businesses and solopreneurs can include blog posts, guest blog posts, social media posts, how-to guides, videos, memes and photo uploads to social media sites, surveys and more. Keep in mind that content marketing goes hand-in-hand with your social media strategy and email marketing strategy. All of the original content that you produce can be shared via your social media channels along with the content that you curate from other professionals. In addition, you can create a sign-up form that links with an email marketing platform such as MailChimp or Constant Contact for email communications to interested parties. This way, consumers who may not have converted to customers keep you on top of mind. Once again, it’s difficult to build traffic purely organically. Search engines present results from the highest authority sites at the top of the SERPs so it’s difficult for new businesses. The pay-to-play strategy is also helpful for content marketers. Sponsoring your posts through social media platforms such as Facebook and Twitter, as well as content distribution networks such as Outbrain or Taboola can increase the number of readers of your content. Some of the best referrals come from friends, family members and colleagues. Surrounding yourself with others in your field or related fields can help you grow your business. Some methods for getting to know others are spending time in a co-working office, reaching out to others via LinkedIn and joining Meetups with solopreneurs and entrepreneurs with common interests. Building this support network will help you keep your sanity, gather new perspectives and drive awareness to your business. Seems Like a Lot of Work? Marketing can be a daunting task for those who are flying solo. We recommend that you use a tool to schedule your workload to get a better handle on your tasks and projects. Check out the LifeTopix app to help you wisely manage your time and business, while on the go.